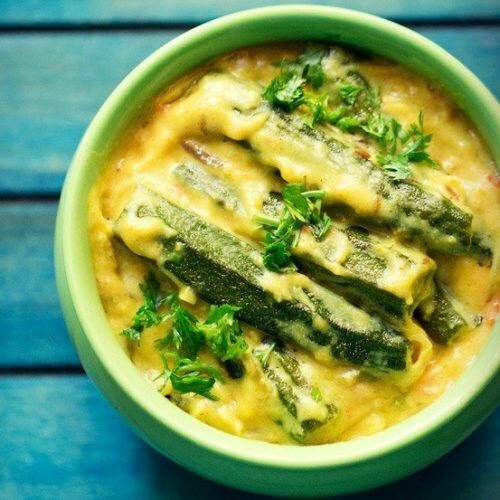 shahi bhindi curry recipe - okra or bhindi in a rich creamy gravy. good side dish with chapatis or parathas. rinse 250 grams bhindi (okra) in water. then wipe dry them with a kitchen towel or just allow to dry them naturally in a plate. slice off the crown and base of each bhindi and make a slit on one side. sprinkle 1/2 tsp chaat masala and 1/4 tsp salt. mix and toss the bhindi very well with the salt and chaat masala. keep aside for 5 minutes. heat 4 to 5 tbsp oil in a pan and add the bhindi. stir very well. saute the bhindi till they become tender and are just about cooked. no need to brown them. drain them on kitchen paper towels. in a dry grinder, powder 14 to 15 cashews finely. if some fat releases while powdering the cashews, its alright. keep aside. beat 1/2 cup fresh curd till smooth and keep aside. crush 1 inch ginger + 4 to 5 garlic + 2 green chilies, crushed to a paste in mortar-pestle. you can also grind these in a small grinder. also slice the onions thinly and chop the tomato. in the same pan, add 1/2 tsp cumin seeds and a pinch of asafoetida. saute till the cumin seeds crackle. then add 1 heaped cup of sliced onions. stir very well. saute the onions till they light golden. then add the crushed ginger-garlic-green chili paste. stir and saute till the raw aroma of ginger-garlic goes away. add 1/3 cup finely chopped tomatoes. stir and then add the ground cashew powder. on a low to medium flame, stir and saute for 5 to 6 minutes till you see oil releasing from the sides. then add 2 tbsp besan or gram flour, 1/4 tsp turmeric powder and 1/2 tsp coriander powder. lower the flame and then add the beaten curd gradually. as soon as you add the curd, quickly stir so that the curd does not curdle. now add 1 to 1.25 cups water. stir again well. simmer the gravy for 2 minutes. then add the sauteed bhindi. stir very well. now add 1 tbsp milk powder/dairy whitener. 2 tbsp milk powder can also be added, but it makes the gravy a little more sweet. substitutes for milk powder is fresh cream and khoya. if adding khoya you can add once the tomatoes are sauteed well. saute the khoya for a minute. if adding cream, then add right at the end when the bhindi gravy is done. stir again. cover and allow the bhindi curry to simmer for 7 to 8 minutes on a low flame. lastly add 1/2 tsp garam masala powder. you can also add 1/2 tsp kasuri methi at this step. stir bhindi curry well. garnish with chopped coriander leaves and serve bhindi curry with chapatis or rotis.